Automotive Engine Performance, 5/e covers both the fundamental and advanced engine performance topics, as well as the practical skills that students must master to be successful in the industry. 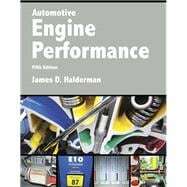 Written by a service technician and an automotive instructor—not a technical writer—and fully up to date with the latest automotive engine performance systems used since 2005, the text is revered as the best available text on the subject. Formatted to appeal to today's technical trade students, Halderman’s text uses helpful tips and full-color, step-by-step visuals to bring concepts to life and guide students through the procedures they'll use on the job. To keep your course current, all of the content is correlated to the latest NATEF task requirements for the NATEF MLR, AST, and MAST designated topics of Automotive Engine Performance Systems (A8); over 40 new photos or drawings are included to bring the content alive; and new or updated information is included on such topics as new OSHA hazardous chemical labeling requirements, Atkinson Cycle engine design, scope testing of MAF sensors, gasoline direct injection (GDI), Fiat Chrysler Multiair System information, and Tier 3 Emission Standards.